She is naturally expert in all the arts (lalita), therefore her service is self-manifested. She cleanses the glittering sweat drops from the lotus feet of Shri Radha and Madhava when They are together. She is perpetually immersed in the most elevated mellow of absorption in satisfying all the desires of the heart of her dear most friend, Shrimati Radhika. I offer my obeissances to the haughty Shri Lalita devi, who is enchantingly endowed with many beautiful and sweet qualities (sulalita). I offer my obeisances to Shri Lalita devi, whose beautiful face mocks the brilliance of the full moon, whose eyes are ever-restless like those of a started doe, who is famous for her extraordinary expertise in the art of dressing Shrimati Radhika, and who is the treasure-house of unlimited feminine qualities. I offer my obeisances to Shri Lalita devi, whose body is adorned with a splendid dress (sari) as brilliant as the multi-coloured tail-feathers of an ecstatically dancing peacock, whose breast is covered with an exceedingly attractive blouse (kanchuli), whose hair part is decorated with shimmering red vermilion, and who wears various necklaces and other jewelled ornaments. Her complexion defeats that of even gorochana [bright golden pigment that comes when rain-water from svati-nakshatra hits the head of a qualified cow] and she possesses innumerable good qualities. I offer obeisances unto the supremely charming Shri Lalita devi, who possesses all divine qualities; who is also the recipient fo Yashoda devi´s parental affection; who is the guru all the sakhis, instructing them in the art of friendship; and the very life of both Shrimati Radhika and the younger brother of Baladeva. I offer obeisances unto the supremely charming Shri Lalita devi, the treasure-house of all good qualities. Upon seeing any young maiden anywhere in Vraja and discerning that she is inclined towards her priya-sakhi Shrimati Radhika, Lalita immediately tells Radha that She must accept this person in Her own party (sva paksha). 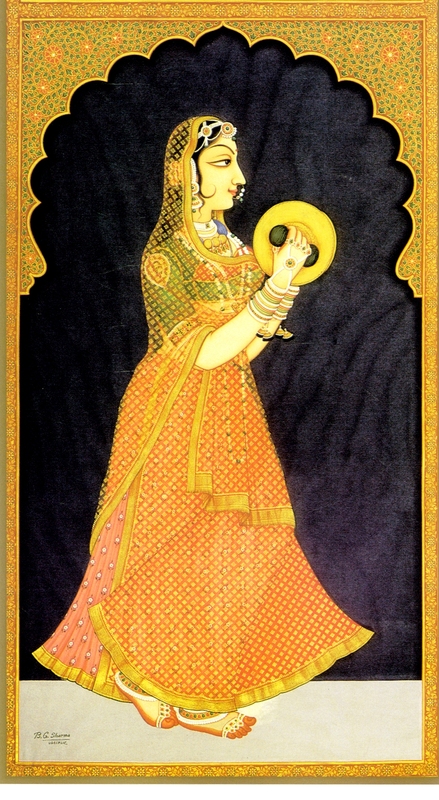 Radha obeys Lalita, who thus fulfils that maiden´s desires. I offer obeisances unto Sri Lalita devi, the embodiment of all divine virtues and the foremost of all the favourite sakhis of Gokula. Her primary task is providing pleasure for Sri Radha Govinda by arranging Their meetings. This delightful service surpasses the enjoyment of all the best festivals combined together. If a person with a cheerful and pure heart recites this ashtaka in praise of Lalita devi, he will be affectionately brought into the Shrimati Radhika´s own group of sakhis. Lalita devi is superbly ornamented with beauty, grace and charm, and along with Shrimati Radhika, is the effulgent wish-fulfilling creeper (kalpa-valli) of Vrishabhanu Maharaja´s family that winds around the kalpa-vriksha of Krishna.